Whether your players are leading the charge or fleeing a superior force, no Game Master wants to spend time drawing sites for ambushes and epic clashes. Fortunately Paizo Publishing's latest Pathfinder Flip-Mat, you don't have to! This line of gaming maps provides ready-to-use and captivatingly detailed fantasy set-pieces for the busy Game Master. Whether it's used during a huge organized conflict or simply any time a fight breaks out, this double-sided combat map is the perfect place to resolve battles. Don't waste your time sketching when you could be playing. 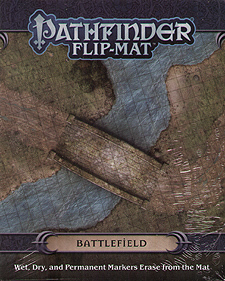 With Pathfinder Flip-Mat: Battlefield, you'll always be ready to let loose the hounds of war!